I had suspected the manuscript had a problem when I decided to run it past the editor on a weekend retreat. No, I wouldn’t have minded if she had said “This is brilliant and I want to buy it,” but that wasn’t the message I received. What she told me loud and clear was that I had a hot mess on my hands. Oh, joy. You should have seen the poor woman’s relief. Instead of each of us defending our opinions, we had a productive conversation about how to come up with a stronger title, what definitely needed to go into the manuscript, and how best to format it. I’d spent a year on the picture book version of this manuscript but when it didn’t work I kicked it to the curb. I want to love it, but more than that I want an editor and young readers to love it too. It doesn’t really matter why I chose to do X and Y. If it doesn’t work, I need to come up with a new way to tell the story. Not that that is an easy decision to make. “But I’ve spent so long on this version! I have to make it work.” I say this even when, with each rewrite, it gets clunkier and increasingly awkward. What I need to do, and I eventually do, is walk away from the project for a while. Weeding the garden, I think about what inspired me to tell this particular story. I think about the audience. I contemplate what’s working in the present form. Only when I have these things in mind do I sit down again to write. But I don’t open the old clunky file. I open a new document and start from scratch. Truthfully, if it isn’t working, it doesn’t matter how long I’ve spent on it. It is time to start fresh with a clear vision in mind. Every time I’ve done this, I’ve been happy with the results. That said, I generally wish that I’d gotten to this point much sooner instead of continuing to struggle with whatever hot mess I've created. Sue--I've done the same thing in the past. I had a hotter-than-hot mess of a manuscript (even I wasn't crazy about it) and had to scrap the whole thing. I chalk it up to "prewriting." All the crappy writing we do, to prepare us for the "real" project/draft, is worth it. And honestly, I think that early drafts are part of the prethinking/working out of the story. It might SEEM like wasted effort, but I think it's crucial in the circuitous route we have to take in order to end up at our destination: a great draft. I agree, Sue! I think there's a certain freshness and edge when you first start a manuscript, and it's either completely awesome and just needs tweaking or it doesn't work. Trying to reshape the whole thing creates a hot mess. I recently decided to start from scratch. In my case, I've sat on it so long that I don't feel in the moment anymore. I want to feel passionate about what I'm working on and immerse myself. 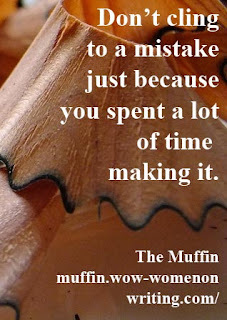 We all do this I think--I sure have clung to mistakes. Thanks for the reminder! I really like Sioux's idea -- to consider it prewriting. The stuff I do before I write a solid draft. Apparently, I am now "prewriting" a middle grade novel!